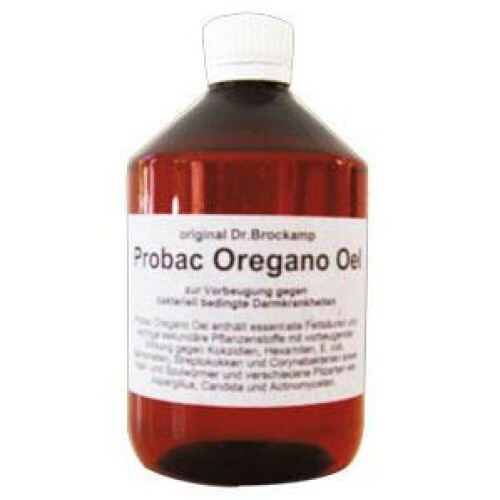 Probac Oregano Oil by Dr. Brockamp, Antibacterial - active energy-oil with complementary herbal elements for the prevention of bacterially induced intestinal diseases in Racing Pigeons. * It stimulates bile production and secretion of enzymes in the intestinal tract, stimulating digestion and optimizing. * Strengthens the immune system against infections such as coccidia, salmonella, parasites, some types of viruses, yeast and other bacteria. * It is an ideal complement Probac 1000 Oregano oil cleans the intestinal tract by promoting the action of bacteria containing the Probac probiotcs 1000. - It is recommended for use throughout the year. - Its effectiveness is greatly enhanced if combined with Probac 1000 and Probac Energy. - Recommended for use after the application of antibiotics, after vaccination, during breeding and molting. - 1 kg of meal in 5 ml of applying Oil of Oregano along with 5 grams of Probac 1000 or Probac Energy, 2 or 3 times per week.